Boston’s campaign to offer travelers more direct air routes to the world’s most important business destinations is preparing to add nonstop service to another key city. Cathay Pacific Airways, voted the world’s best airline by travelers this year, will start flying nonstop between Boston and its base in Hong Kong in May next year. The airline will become the second to offer direct flights to China from Logan Airport, following the Beijing route added by Hainan Airlines in June. Officials said the Hong Kong flights would provide businesses travelers and tourists with better access to major cities in Southeast Asia. The Massachusetts Port Authority, which runs the airport, has been expanding its international service over the last few years. It often partners with state officials and local business leaders to attract new carriers. Since the spring of 2012, Copa Airlines added a trip to Panama City, Emirates launched a flight to Dubai, Japan Airlines added Tokyo, Turkish Airlines started service to Istanbul, and Hainan began the Beijing flight. The 16-hour Hong Kong flight is scheduled to run four days a week, leaving Boston on Tuesday, Wednesday, Friday, and Sunday. It departs Hong Kong on Monday, Tuesday, Thursday, and Saturday. In the summer, the flights will leave Boston at 1:45 a.m. and arrive in Hong Kong at 5:35 a.m. the following day, according to MassPort. The return trips will leave Hong Kong at 6 p.m. and arrive in Boston at 9:30 p.m. Flight times will vary slightly in the winter. The plane, a Boeing 777-300ER, will carry 275 passengers and offer first class, business class, premium economy, and economy cabins. Cathay Pacific has not disclosed how much the trip would cost, but the airline’s round-trip tickets for midweek travel between New York and Hong Kong next month vary dramatically in price. Economy seats are available for $973.88 while some first-class accommodations on that direct route cost more than $20,000. The new Hong Kong flight should appeal to professionals in Boston’s financial services, technology, education, and health care industries, said Thomas Glynn, chief executive of Massport. 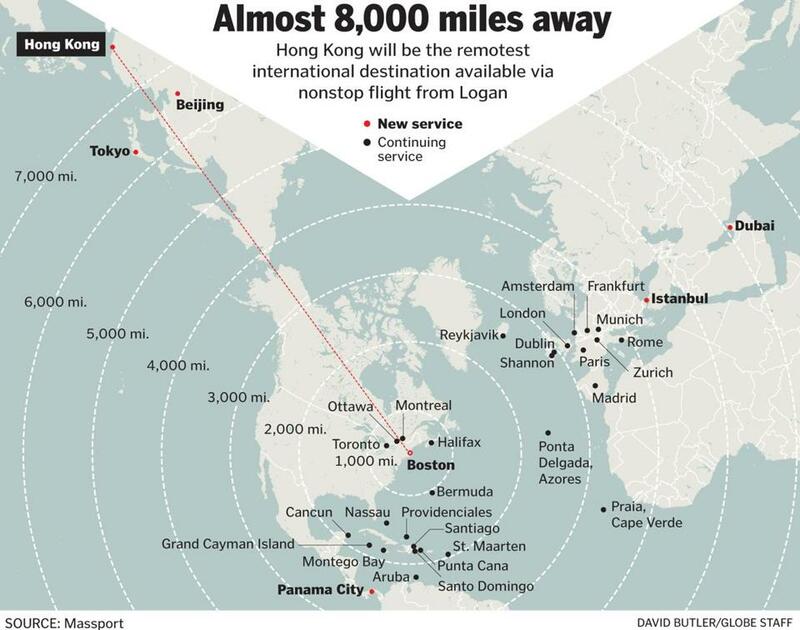 About 330,000 passengers fly annually between Logan and Hong Kong. The vast majority of those passengers continue on from Hong Kong to the other 44 Asian cities Cathay Pacific serves, according to MassPort. Tom Owen, senior vice president for Americas at Cathay Pacific, expects the route to be popular with travelers destined for Taipei, Manila, Singapore, and Ho Chi Minh City, formerly known as Saigon. 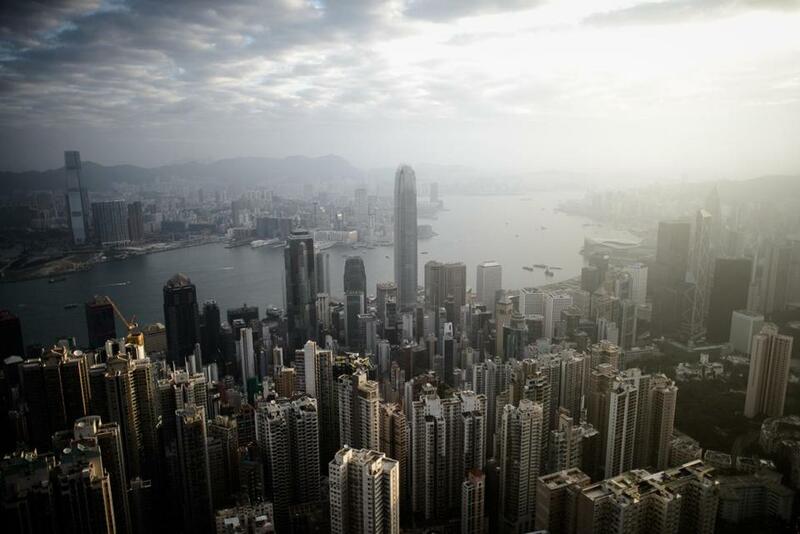 The company currently operates direct Hong Kong flights to New York, Newark, Chicago, San Francisco, and Los Angeles. Now many Boston travelers are routed through New York and the new flight will reduce the trip by about four hours, Owen said. “I’m confident that we will be able to grow it to a daily service soon,” he said. “The service levels and the in-flight experience is dramatically different than all of their competitors,” Friedman said. The rating site Skytrax named Cathay Pacific the best airline in world in 2014 based on a survey of more than 18 million travelers. First and business class seats reclined into fully flat positions. Cathay Pacific airplanes are equipped with rice cookers, toasters, and skillets to serve made-to-order breakfasts and hot rice with meals to first class passengers. The company recently partnered with the Mandarin Oriental Hotel Group to offer a foie gras terrine with winter truffle, smoked salmon with crabmeat and caviar, and other fine dining options created by the hotel’s acclaimed chefs on flights between Hong Kong and London. Taryn Luna can be reached at taryn.luna@globe.com. Follow her on Twitter @TarynLuna.